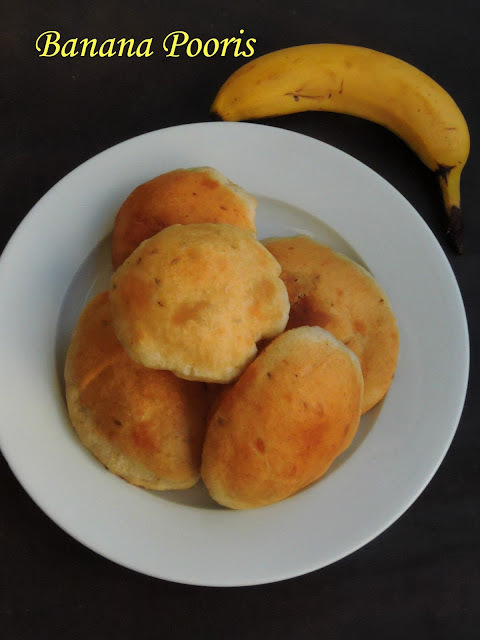 Have you ever tried your hands in making pooris aka buns with banana, then you should have a look to this puffy beauties. Mangalore Banana buns are quite famous in both Udupi-Manglore, though these buns are popularly called as Mangalore buns. Its an excellent evening tea time snack prepared with over ripen bananas along with both wheat flour and all purpose flour or else just with all purpose flour. A delicious pooris to give a try if you have some overripe bananas sitting in your fruit baskets. Trust me these puris are extremely spongy and puffy. Being a home maker, i always love to bake my own bread at home with easily available ingredients from my pantry. However i have still number of bakes to try,obviously i love to be a part of many baking groups. Unfortunately since ever i started working, i couldnt able to catch up with many baking groups. Somehow few baking challenges are very close to my heart and i never want to give up though life is super busy. One among those baking challenges is We Knead to Bake, a monthly baking event started by Aparna. I have baked many fantastic breads coz of this baking group and its still going on. 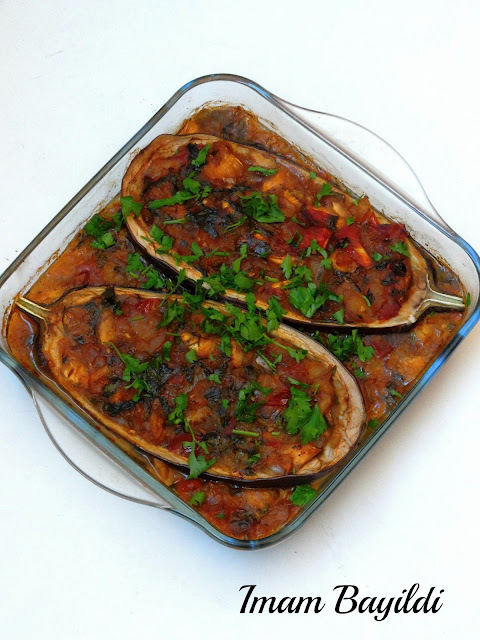 Imam Bayildi is a Turkish dish calls for whole eggplants, which is later stuffed with a mixture of onions, garlic and tomatoes simmered in olive oil. Its is one of the most known and popular Turkish olive oil based dishes, you can serve this dish either at room temperature or warm. Imam Bayildi literally means The Imam Fainted, a funny name rite. Actually many tales do exists to tell us the reason behind this funny name. Wikipedia says that this name is derived from a tale of a Turkish imam who fainted once he heard the cost of the ingredients or the amount of olive oil used to cook the dish. An another folk relates that an imam married the daughter of an olive merchant and her dowry consists of twelve jars of finest olive oil.. Everday she prepared an eggplant dish with tomatoes and onions, on the thirteenth day, there was no eggplant dish at the table. When the imam heard that there was no olive oil, the imam fainted. Seriously these both tales made me laugh. 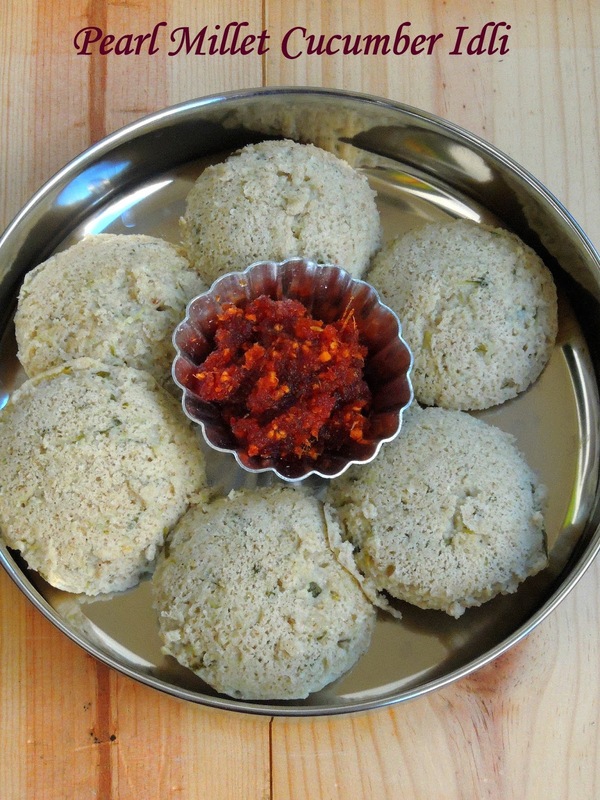 Kadamb/Taushe idli/Southekayi Kadubu/Thoushe Muddo - This is how Cucumber idli is know in Konkani cuisine. Though cucumber idli is usually prepared with either rice rava or semolina, my version of cucumber idli is completely different from the traditional one. Do you know, traditionally this cucumber idli is steamed in Turmeric leaves to give a nice aroma after cooking. However my today's post is not a traditional one, and i may say proudly that its one of my creation which is tweaked by myself after going through many cucumber idli posts. Since i dont want to make this idli with rice rava or semolina i opted for a usual pearl millet idli batter in which i mixed a grounded paste of cucumber-green chilly and some grated cucumber. Trust me this idlis came out with a nice flavor and delicious as well. 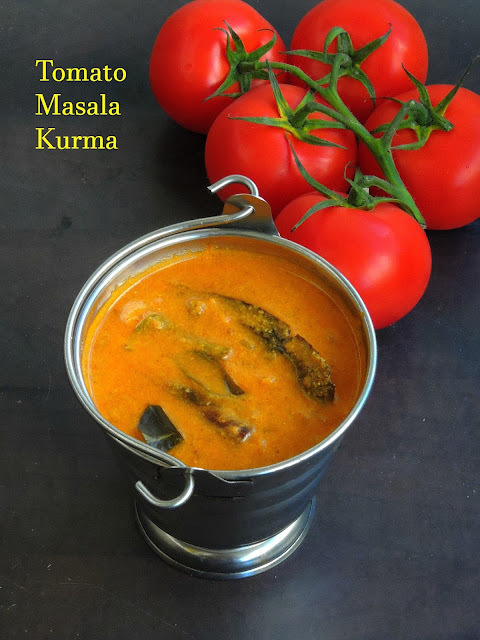 If you are searching for a fingerlicking goodness gravy for rice or a lipsmacking side dish for idlies or dosas, then you should give a try to this flavourful kurma. Simple to make, this kurma is highly flavourful as this kurma calls for poppy seeds, fennel seeds, roasted gram and grated coconut which is grinded as fine paste to give the aroma to this fingerlicking kurma. Usually chopped tomatoes are sauteed until they turn mushy to prepare kurmas, but my today's recipe calls for tomato puree which is simply prepared by deskinning and deseeding the tomatoes. The best part of this kurma is this gravy can be served with anything. You can prepare this kurma for your breakfast and you can serve again for lunch with rice or else for your dinner with rotis. One more checkerboard bread, though i want to make something different. To be honest, this bread was my favourite as these cuties came out extremely spongy and super soft. Yes i prepared this bread dough with tangzhong method. Whoever bake their own bread at home knew very well about this famous Tangzhong method. This method have its origin from Japan, and very much used by home cooks to get a nice fluffy, spongy breads at home. Breadflour and water cooked together makes a pudding like paste and this paste is added to the bread dough, this is how tangzhong method consists.I have already tried couple of breads with this method and everytime the bread prepared with tangzhong method is a big hit at home. Though am not satisfied with the checkerboard pattern of my today's post, i dont have any other option than posting them. Am in summer vacation, and thought to do so many stuffs for my blog, but life was bit busy. The first day of my vacation started with too much of stress, yes mom went a major operation and i was very much worried about her, fortunately everything went well and she was in hospital till wednesday. When you are stressed or worried,dont ever try to make things you cant manage to do. I did and lesson learned. 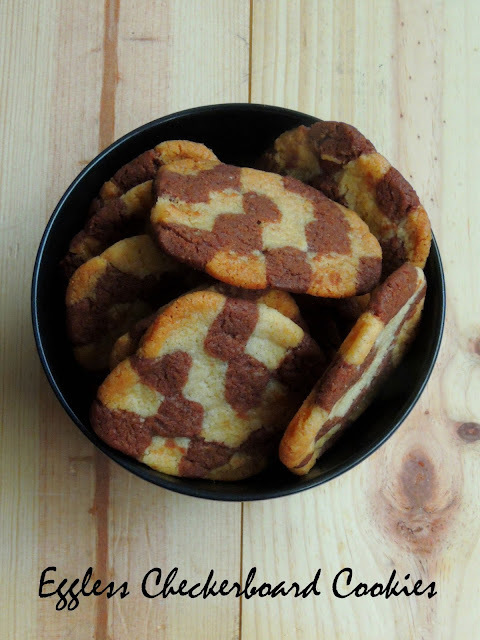 Few days back when i was so much stressed and worried about my mom, i baked these cookies just to divert my mind. But unfortunately i went wrong with the pattern, though the cookie dough came out super prefect. 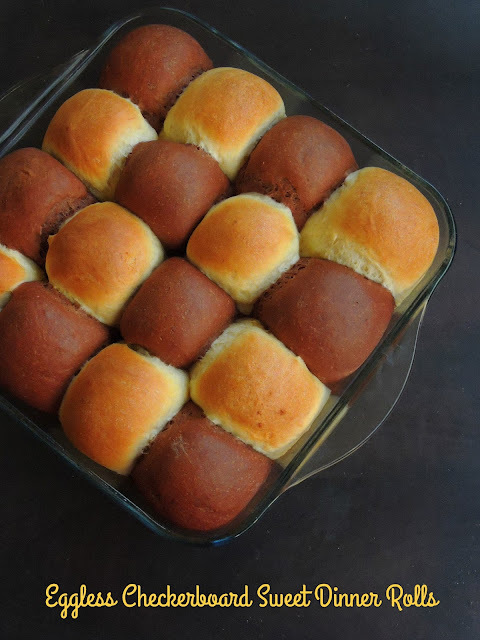 If you are wondering how to make a checkerboard dinner rolls, dont hesitate a second to go through my today's post. Why am posting checkerboard dinner rolls, i have a reason for it. I picked checkerboard theme as this week's theme of blogging marathon. 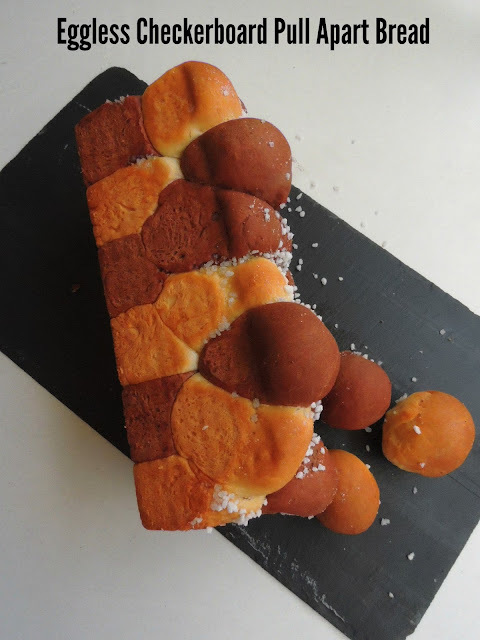 To bake a checkerboard dinner rolls, you need to just prepare two colour yeasted doughs and bake them out as this cute looking checkerboard theme dinner rolls. My today's post calls for an eggless version of yeasted dough which i simply prepared with a chocolate yeasted bread dough and a usual bread dough. 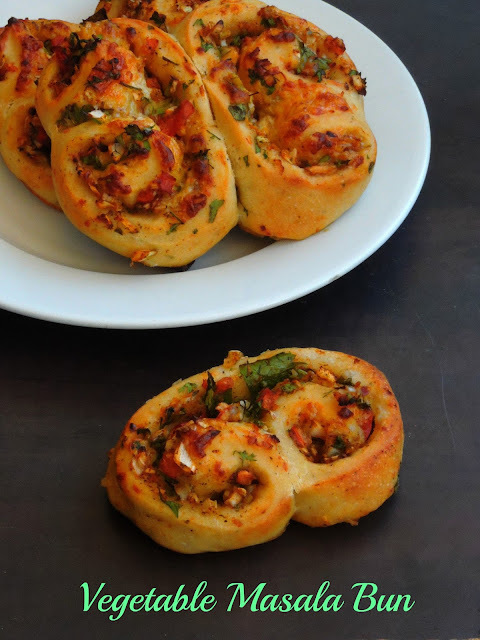 Sine i want to bake some easy breezy dinner rolls i dont want to shape them, hence a simple shaped dinner rolls. 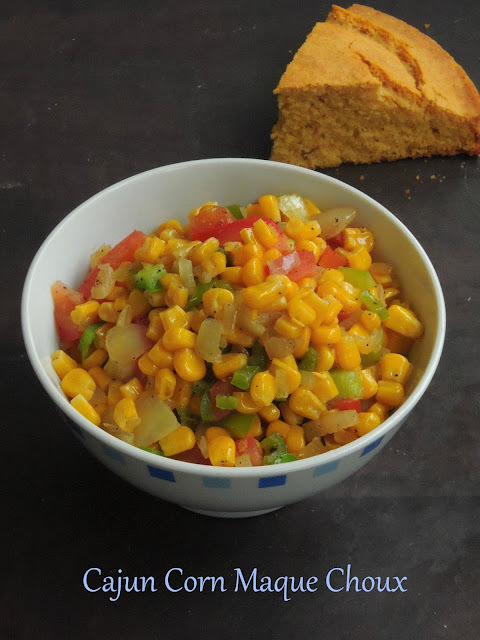 Corn maque choux is a traditional dish of Southern Louisiana region of United States. Wiki says that this dish is thought to be an amalgam of Creole and American Indian cultural influence, and the name is likely to derive from the French interpretation of the Native American name.Corn maque choux calls for corn, green bell pepper, onion, and sometimes garlic, celery, and tomato. The ingredients are braised in a pot. Historically bacon grease was used for the braising stage, though oil, butter, or cream may be substituted. The vegetables are then left to simmer until they reach a tender consistency as the vegetables are cooked with chicken stock or water. The dish is finished with salt and a combination of red and black pepper. Some cooks include hot sauce and a bit of sugar to tickle the tastebuds. 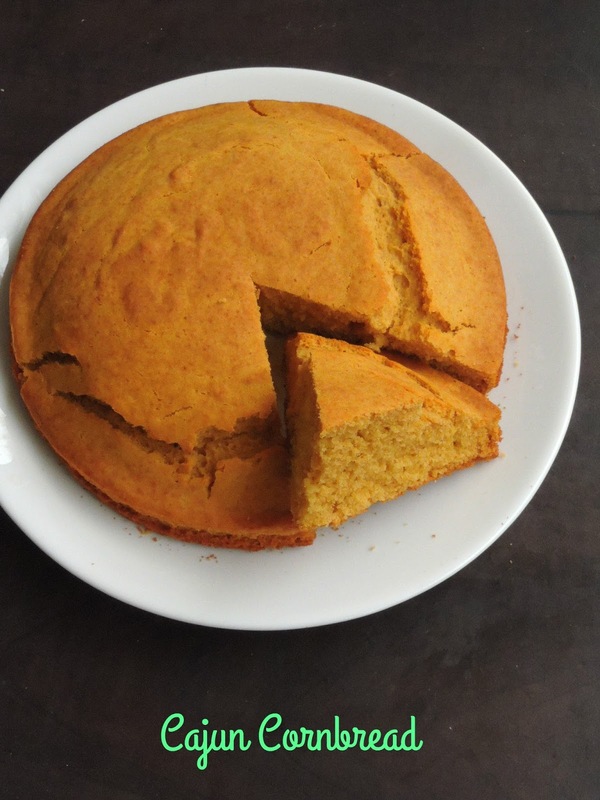 If you love spicy corn bread in your meal, then you should have a look to this Cajun Corn bread. This bread is almost like usual cornbread though hot sauce or jalapenos are added to this Cajun special. This bread makes an excellent meal when served along with many delicious Cajun stews or sauces. 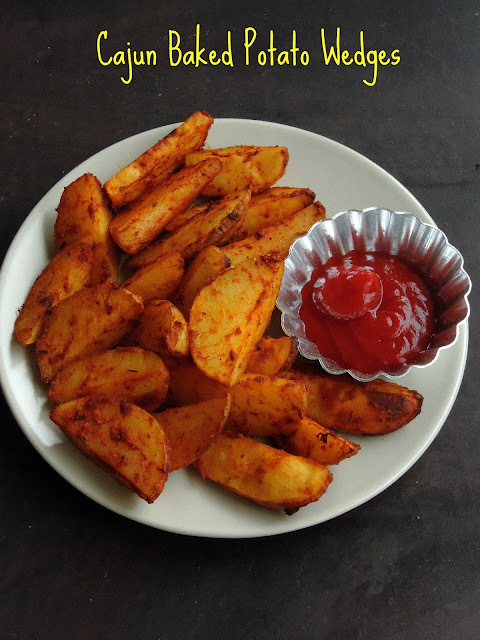 Its one of most favourite accompaniment and its quite a common staple on the Cajun dinner table. Obviously many versions of Cajun cornbread do exists if you search for this incredible quick bread. However i picked one of the easiest and loved it to the core. Some cajun corn breads calls for cheese to make this simple corn bread more flavourful and cheesy, however cheese is not a must and you can still make a fabulous Cajun corn bread with simple ingredients available in your pantry. This week is going to be Cajun cuisine and this style of cooking is from Louisiana, United States. This cuisine is deported by the British from Acadia in Canada to Acadiana region of Louisiana. This cuisine is a rustic one and most of the dishes from this cuisine is prepared with locally available ingredients with simple preparation. Actually this cuisine uses many method which is quite known in French cuisine with a touch of Creole cuisine. Herbs like parsley, bay leaf,greens onions are used often in this cuisine.Rice is a staple food of this cuisine though wheat is used in baking bread. Peanut butter and jam sandwich is our family favourite, this sandwich have its own place in our weekend brunch. When i picked sandwich without bread as theme for this blogging marathon, i want to replicate the same Peanut butter & jam sandwich. Since this week's theme is sandwich without bread, i opted for puffed spelt cake. These puffed spelt cakes makes a guilt free snack whenever i feel hungry obviously my pantry will always have these cakes. Puffed spelt cake replace very well those bread slices and this puffed spelt cake sandwich rocks. Simple to make, this sandwich asks for just 5minutes preparation. 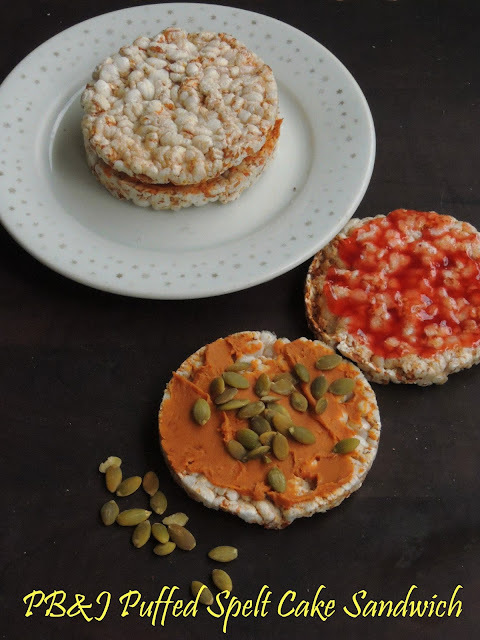 Yes you read it rite, just spread the peanut butter and jam over those puffed spelt cake, just sandwich them your sandwich is ready to indulge. 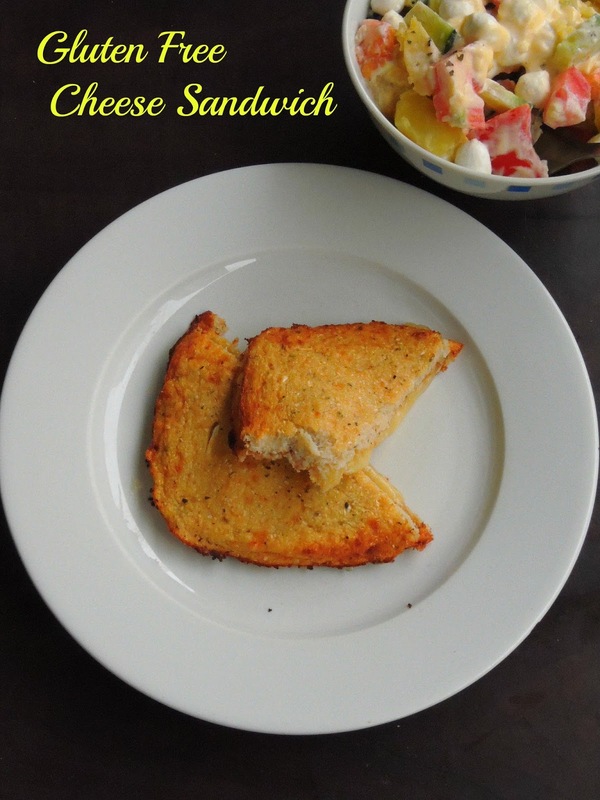 Very simple to make, my today's post calls for refreshing no cook vegetarian sandwich. Cucumber, tomato and mozzarella works awesome together in salads, when its comes to sandwich this combination works absolutely tremendous. If you are a follower of my space, you might have noticed that am running this week's blogging marathon with Sandwich without bread as theme. After a super cheesy and gluten free cauliflower crust sandwich, my today's post goes for quick, crunchy and very refreshing sandwich with just three main ingredients. 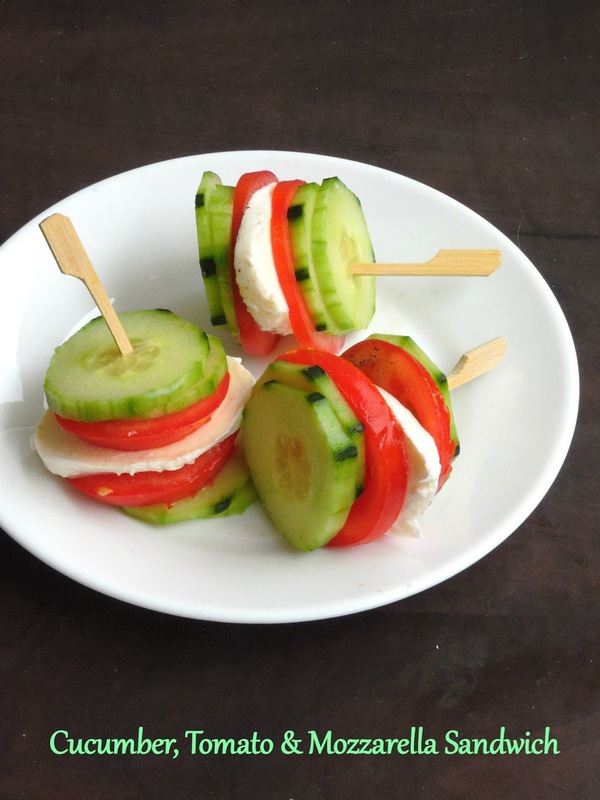 Inserted in a skewer, this cheese and vegetable sandwich makes an excellent sandwich to serve for a starter if you are planning a get together. If you put yourself in a dilemma of dishing out sandwiches with bread, am sure your brain will think twice than ever. Its happened to me recently and i seriously want to come up with three different sandwiches without bread. You may wonder why sandwiches without bread, yes i have picked Sandwiches without bread as this week's blogging marathon's theme. Once i picked this theme, i was quite excited to dish out some interesting sandwich without running behind those bread slices. Trust me, i simply enjoyed this theme by preparing three different sandwiches with interesting ingredients in it. For my today's post, am posting this low carb version of sandwich, yes this sandwich is prepared completely with finely grated cauliflower.